The Hardy Furnace hot water system can be used to melt snow and ice from driveways and sidewalks. Hot water is pumped from the Hardy through tubing under the concrete, which radiates heat, thus melting snow and ice. The domestic water line connects to a heat exchanger on the Hardy furnace. The pressure on the supply line forces water through the heat exchanger when you open a hot water faucet inside your home. As this water is passed through the heat exchanger it is heated and then goes in the cold water input on your hot water heater, thus preheating all your domestic hot water. This provides hot water for all your household needs. This will produce an immediate and dramatic decrease in your hot water heating cost. The Hardy provides hot water for your dairy and shop from the hot water stored in the hot water heater preheated by the heat exchanger on the Hardy Furnace. The shop can be heat by a Hydronic or forced air system. 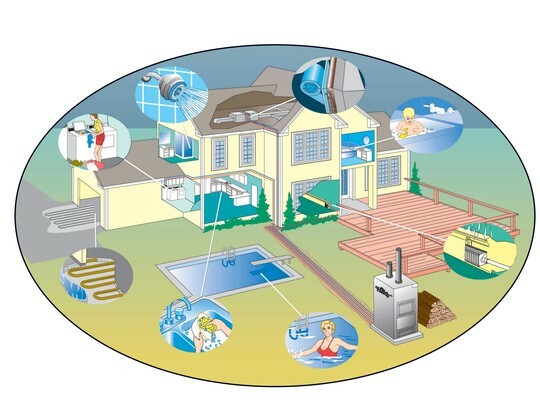 The Hardy can heat your swimming pool with a heat exchanger swimming pool kit option which includes a pool pump, pool thermostat, and low limit sensor to provide the most effective and efficient way to heat your swimming pool. A hot water heating coil is installed in the supply side of your new or existing air handler and ductwork. A new wall thermostat which regulates heat from the Hardy Furnace performs two functions: when it senses your need for heat according to your temperature setting, it turns the water pump on to circulate the hot water through the coil and secondly turns on the blower inside your central unit to force air across the hot water coil. This forces hot air into your central duct system. Your existing furnace can serve as a backup heating source. The Hardy Furnace can be connected directly to a new or existing boiler heating system. The Hardy circulating pump supplies the flow of hot water. The existing pump, zone valves, and baseboard radiation transfer the heat through the house. The existing boiler system can serve as a backup heating source. The Hardy can be connected to any existing Hydronic heating system that operates at 180 degrees Fahrenheit or less. The Hardy Furnace can supply the necessary hot water to provide heating comfort for your Hydronic radiant floor system. The water circulates from the Hardy Furnace tubing inside the concrete or wood floor construction. With the Hardy hookup, the system temperature can be controlled on a room-by-room basis. Energy is spent only when and where needed. Strategically placed thermostats recognize the deviation in temperature and react promptly with efficient and economical Hardy heat. Areas of the house not used can be set back to conserve energy. Homes without existing duct work can enjoy the advantages of Hardy heat with the Hardy Fan Coil Unit. The fan coil unit can be located central to the areas to be heated. Water is circulated from the Hardy Furnace through the fan coil unit in your home. The fan in the fan coil unit forces air across the hot water coil sending hot air into the area to be heated. The temperature of your home is regulated by a thermostat mounted on an electrical outlet adjacent to the fan coil unit. pressurized boiler. Standard features on Hardy Furnaces are an adjustable aquastat, combustion blower for damper control, 4GPM at 20 feet of head circulator pump with an on/off control relay, and automatic water level controls. The Standard Hardy also comes equipped with a heat exchanger to provide hot water for your domestic use. The Hardy provides hot water for hot air duct systems, water baseboard, radiant floor heat, unit heaters and other existing Hydronic systems. The Outside cover is constructed of 24 and 26 gauge 304 stainless steel to give you years of maintenance free service. The stainless steel cover will not fade, needs no painting and does not require any weather protection. The primary Hardy design goal is to give years of good service and make it easy to maintain.